On the week where Dublin Simon Community recorded the highest number of rough sleepers since their records begin, outreach worker Martina Bergin writes about what it’s like for people sleeping on the streets. As more and more people enter into homelessness, beds are like gold dust. It is first come first served. There is a term known as the ‘Blue Brigade’, which refers to the unfortunate ‘few’ who have to sleep rough on the streets. The number of these people has dramatically increased in recent years. They are scattered across the city streets, in doorways, under bridges, on the floors of garda stations, in the parks and down laneways. They huddle up together trying to get a few hours of sleep. These are the ones that did not get a bed and are directed to hostels to collect a sleeping bag. These are the people that are left exposed and vulnerable to all dangers that a person may face when closing their eyes on the city streets. Sleeping in pairs is the safest way to survive rough sleeping. It means having someone to watch your back, provide company and even body heat. Pairing up with someone also gives the security of knowing there is that extra help if you need it. These are just a few of the many stories we get when clients come to the Rough Sleeper Team. The least we can do is to always ensure we have a supply of sleeping bags to offer those who rough sleep. Over the past few years the number of those bedding down has increased. Six years ago, our routine early morning street counts averaged about 28 people bedded down on a daily basis. Those numbers have risen every year. On Tuesday, I counted 168 people bedded down in the inner city. This number only refers to the most visible spots in our city. Rough sleeping is a dehumanising experience. Not only does a person have no home or safe place to stay at night but the reality is that they also lose all independence, confidence, safety and support that they may once have had. You become dependent on welfare services for money and for accommodation. You need to give personal details and fill out consent forms which are then passed from one person to another, care worker to keyworker, welfare worker to placement worker. It’s a daunting system to navigate but imagine trying to do it without having slept, without feeling warm and not having washed yourself or changed your clothes because you have just woken up on Henry Street. People who are experiencing homelessness find themselves navigating services that, even after eight years working with Simon and dealing with homeless services, still confuse me. Our team do our best to support people who are rough sleeping in whatever way we can. Our goal is to help them access all services they may require and help them secure a roof over their head. We listen to the needs of our clients offering services such as the Mobile Health Unit three times a week. This unit moves around the city and reaches out to some of our most vulnerable clients, many of whom have endured the consequences of rough sleeping and the toll this has taken on their health. 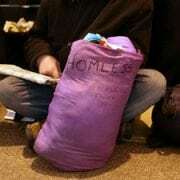 Rough sleepers bedding down are exposed to all weathers from extreme winters, rain and the very occasional warm summer. Ireland’s damp weather also has serious implications for health including foot and respiratory problems. We also encounter hip and back problems caused by sleeping on hard ground. 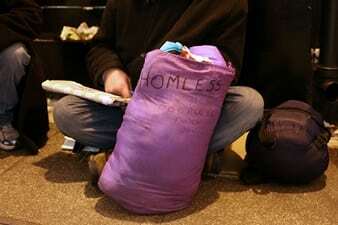 These latter problems are inevitable from the conditions people rough sleeping are forced to endure. As a result, our team are always in need of items such as socks, underwear, hygiene packs, sleeping bags and fresh warm clothing. We receive amazing support from local communities and schools who organise collections for care packages and Winter Woollies that we can distribute. Having a supply of socks, underwear and clothing ensures that the clients we work with can put warm fresh socks on their feet each day. This is important as our clients often walk around for 12 hours, punching in time before they can go in search of the ‘perfect doorway’ to sleep in that night. These essential items and sleeping bags may seem simple but these supplies make the world of difference to the men and women forced to endure homelessness. I and all those I work with would not be in this job if we didn’t feel like we were making a difference to the lives of our clients. There has been many success stories, many achievements that make the effort we put into our jobs all worthwhile. It is humbling when a client ‘thanks’ you. It can be a weird feeling as you don’t sometime feel they should be thanking you. It’s a persons right to accommodation, safety and access to health services and to be thanked for offering those basic services to someone is the least any of us can do. Dublin Simon Community work across Dublin, Kildare, Wicklow and Meath providing outreach, treatment, housing, homelessness prevention and education services. Together with the kindness of our supporters we help our clients move on from homeless towards a secure home of their own. Our services have expanded and developed to meet the needs of our clients and will continue to do so until homelessness no longer exists. The Rough Sleeper Team will be there until that happens on the streets, seven days a week, 365 days a year, working with the most vulnerable and ensuring we can support them as best we can. For more information on Dublin Simon Community please visit dubsimon.ie. Piece courtesy of thejournal.ie on 22/09/2016.